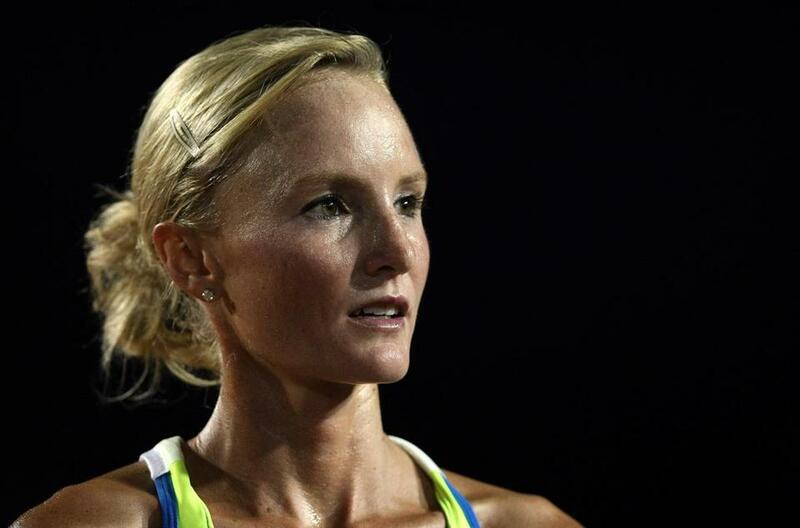 Shalane Flanagan is capable of becoming the first American woman to win Boston since 1985. She pauses for dramatic effect, then laughs. No professional runner in her marathon prime would do that, certainly not someone like Flanagan who appears poised for more record-breaking success. But the joke reveals how much the Boston Marathon means to Flanagan, how it took hold of her young imagination and never loosened its grip. “In my heart, I would feel complete winning Boston,” she said. “I would feel very fulfilled with my career. I would have exceeded all expectations. I have an Olympic medal. I’m a three-time Olympian. I have all these track records. Then, to win Boston, what’s better than that? Retiring wouldn’t happen because I love running so much. I want to continue and see what I can do. That thinking comes naturally from growing up in Marblehead and watching the Marathon on Patriots Day. In middle school, Flanagan cheered elite runners, and her father, Steve, from Boylston Street. She was captivated by the spectacle. Flanagan dreamed of striding down the historic homestretch, though running 800 meters seemed a long distance back then. Making her Boston Marathon debut Monday as one of 18 elite women is a “full circle” moment for Flanagan. And it could be much more. Flanagan will arrive at the starting line a strong contender for the women’s title. The 2008 Olympic bronze medalist in the 10,000 meters and American record-holder in the event (30:22:22) has the speed and, after years of marathon-specific training, the strength and endurance to cover a fast start, midrace surge, and sprint finish. Flanagan is capable of battling the Kenyans and Ethiopians down Boylston Street and becoming the first American champion since Lisa Larsen Weidenbach (now Rainsberger) won in 1985. Still, with three marathons on her résumé and nearly four years of marathon-focused training under coach Jerry Schumacher, Flanagan believes the timing is right for a big Boston debut. After all, she’s waited a long time for this moment, by her calculation 17 years since her middle school days. Schumacher believes the wait will be worth it. The Santa Fe Trail starts 7,250 feet above sea level, then drops nearly 500 feet over several quad-punishing miles. Tracing the eastern edge of the Front Range, the sandy path rolls through clusters of evergreen trees, high plains, and Air Force Academy territory. Pikes Peak looms in the distance as several sharp inclines test tired legs and lungs. Imagine the Boston Marathon course transported from paved streets to rugged, high-altitude Colorado. This winter, Flanagan and training partner Kara Goucher did exactly that. With her blond ponytail rhythmically swinging side to side, Flanagan cut a lean, fast figure along the Santa Fe Trail. She favored the route because it simulated what she will experience Monday. And from a childhood immersed in the Boston Marathon, Flanagan knows Boston is as much about the legendary course as the competition. After placing 10th in the marathon at the London Olympics, Flanagan acknowledged she “almost didn’t finish.” She was “too aggressive too soon,” then “tried to push through the wall and made things even worse.” As a result, the last 10K seemed much longer than it was. She slipped from fifth to 10th over the final few miles. The experience taught Flanagan the dangers of training too intensely and the value of being “cautiously aggressive” in marathons. Leading up to London, Flanagan and Goucher ran a string of 120-130-mile weeks with three speed or “quality” workouts per week. Schumacher now recognizes “because it was the Olympics everyone made more out of it than we needed to and may have pushed a little too hard.” In preparation for Boston, Flanagan and Goucher dropped their mileage to around 115 per week with two quality sessions. Also, they moved from their home base of Portland, Ore., to the thin air of Monument, Colo., for much of their high-mileage work and their last critical training phase in March. Flanagan estimates she has trained at 95 percent for the last few months. She is “leaving that last 5 percent up to the other factors that make me a great racer.” That said, Flanagan believes her Boston buildup struck the right balance between high mileage and speed work for her 5-foot-5-inch, 113-pound frame. She came to workouts with fresher legs and better focus. And it showed. At the Rock ’n’ Roll New Orleans Half Marathon Feb. 24, Flanagan finished second in a personal-best 1:08:31. She followed that performance with a 10,000 meter Stanford Invitational win in 31:04.85. Flanagan appears capable of a 2:22 marathon, much faster than the 2:25:38 personal best in her 2012 Olympic Trials victory. On a commemorative banner high above Boylston Street, Flanagan surveys the famous Boston Marathon finish. She is the perfect picture of late-race intensity, neck muscles straining, delicate features furrowing. Flanagan calls the banner “surreal.” In many ways, she is still the middle school student awed by the Boston Marathon fanfare. Her father, however, sees the banner as the ideal decoration for the family’s postrace party in Marblehead with catering by Kelly’s Roast Beef. It’s understandable if Steve Flanagan sometimes sees the 2013 Boston Marathon as a family event. These days, it’s rare to have a locally produced Olympic distance runner, even rarer to have one in contention for the Boston Marathon title. Walking his dog around his Marblehead neighborhood, Steve is constantly asked about Shalane and the race. “Everybody in town owns a piece of her success because she’s the ultimate hometown kid,” he said. To deflect some of the attention, Steve continues the joking. “I’ve told people that the party is to celebrate her sister Maggie’s Boston Marathon debut and that the other daughter, Shalane, will also be there,” said Steve. Maggie Flanagan will make her Boston debut in the massive pack that trails the elite competitors. She’ll run knowing that Shalane is “happy to share the stage with family because she doesn’t love attention, but does what’s needed because it’s part of her job.” While Maggie trained harder for Monday’s race than any other running endeavor, she acknowledges lacking the competitive drive, discipline, and intensity that Shalane has possessed since childhood. Those qualities made Shalane a standout runner at Marblehead High School and multiple-time NCAA champion at the University of North Carolina, laying the foundation for professional success. Yet, Shalane’s last few months have been monkishly dedicated to running Boston. As marathon day approaches, the final challenge is keeping the long-awaited race in perspective. To do that, Steve Flanagan turned serious. He knows firsthand the fickle nature of racing 26.2 miles. On Monday, that will be a runner from Marblehead who hopes her full-circle journey finishes with a triumphant sprint down Boylston Street, speeding past the spot where the world’s top marathoners once left her awestruck.